Oil does a number of important things in an engine. It helps cool the engine by transferring heat; seals the gap between piston rings and cylinder walls; absorbs contaminants; and suspends soot particles that are the residue of combustion. Contaminants can be organic such as fungus and bacteria from the air. Inorganic particles can be a host of things, including dust that is sucked into the engine during running. If left by itself for very long the oil would become saturated with the byproducts of combustion. It would carry minute, harsh particles that would wear the oil pump's machined components as well as the bearing surfaces in the engine. It always has done so, but in early engines the oil was changed so often (due to burning and poor oil quality) that no filtration was required. Later on some manufacturers put mesh screens in the oil path to grab bigger particles but this was not very effective. The first oil filters were introduced in the early 1920s (Ernest Sweetland invented it and named if "Purolator," meaning "pure oil later.") Filters of many designs were offered as optional and aftermarket equipment for decades, but they didn't start showing up as standard equipment until the 1950s. These devices solved the contamination problem and allowed [relatively] extended periods of service for each oil change. By the mid 1960s, oil chemistry and filter technology was advanced enough to allow 4000+ mile change intervals. The original canister-type oil filter was quickly replaced by "spin-on" filters, except in a number of British sports cars that suffered from a lack of development funding. The spin-on filter is universally used today. The outside of the filter is a metal can with a sealing gasket that allows it to be tightly held against the engine's mating surface. The base plate of the can holds the gasket and is perforated with holes around the area just inside the gasket. A central hole is threaded to mate with the oil filter assembly on the engine block. Inside the can is the filter material, most frequently made from synthetic fiber. The engine's oil pump moves the oil directly to the filter, where it enters from the holes in the perimeter of the base plate. The dirty oil is passed (pushed under pressure) through the filter media and back through the central hole, where it re-enters the engine. Typically, filters have two media types: primary and secondary. The primary media can stop particles as small as 25-30 microns (human hair is 65-70 microns in size) and the secondary media can stop particles as small as 5-10 microns. "Full flow" filters only utilize primary media. Secondary media limits flow, so the use and placement of it is highly restrictive in filters. Secondary media, when incorporated in a filter, operate in a partial-flow way. Inside the filter a small portion (1-10%) of the oil is directed through the secondary filter and the rest flows through the primary. The longer a filter is on the car the more particles are suspended in the media, until a point is reached where oil can't flow through it. 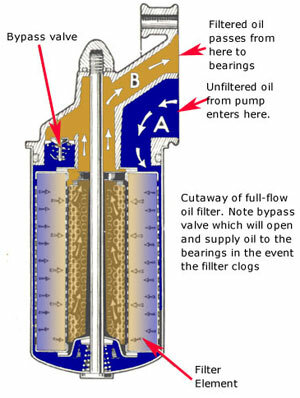 A bypass valve is incorporated in the engine's filter assembly to handle that situation, but once the oil bypasses the filter no cleaning action takes place. A few filter manufacturers are extolling the virtue of placing magnets in the filters to trap metal particles. They claim that magnetic forces stabilize the oil molecules; that the longer the magnetic field is in place the greater the benefit; that fuel mileage is increased; oil consumption and emissions are decreased; and engine power is increased. None of these claims are true and several are impossible. Magnets do remove some sub-micron sized iron particles that are there as catalysts to aid combustion and also attract small ferrous metal particles that might be inside the engine oil galleries, but neither of these account for much effect in the real world. The bulk of the metallic particles floating around in an engine are from bearing materials and these aren't ferrous. Magnets won't "see" them. The price range of filters is quite broad. They are sold at auto parts stores for as little as $2 and as much as $15, and prices at dealerships can be much higher. Can the design of filters be so different that such prices are justified? Won't a cheap filter work just as well as an expensive one? Aren't all filters warranted against failure? The answer is yes to all these questions, but there are caveats. Generally speaking, the more money you spend the better the filter is. However, just like jewelry and clothing, some of your money is being spent for a name. We don't recommend you buy "house brands" and other unknown brands of oil filters, even though they might look identical to the name brands. The manufacturer of such filters might have taken shortcuts in making the product. Light-gauge metal, loose (or shredding) filter material and poor quality gaskets can lead to premature failure, and getting one of these suppliers to cover engine damage would be an exercise in futility. The most important feature of a filter, if you think about it, is the gasket. It has to seal the oil in the system for thousands of miles, in an atmosphere of heat and vibration. Gasket quality is very important, and low-priced filter manufacturers tend to use gaskets that get hard and brittle after just a few thousand miles. Leaks - and worse - can result. So what should you do? Well, we believe that name-brand filters costing $6-$10 at auto parts stores will work very well for you. Feel free to spend more for "dual stage" filters, but remember that the secondary filter material inside doesn't filter all the oil all the time.